Reputed NGO – Deepshikha Mahila Bal Utthan Samiti and Deepshikha’s Compucord organized on World No Tobacco Day at KIran Nursing Home, Hatwara Road, Sodala, Jaipur. 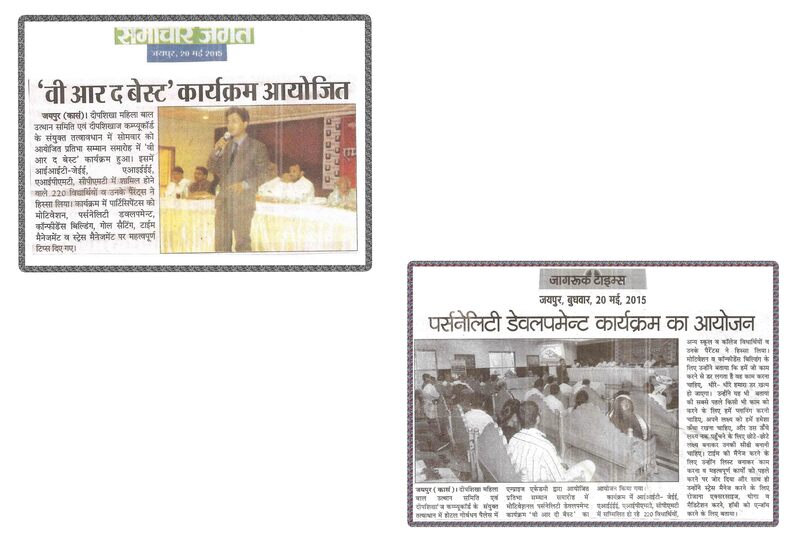 Senior specialist doctors of Homeopathy, Ayurved and Allopathy told participants about protection from tobacco intake. India’s favourite Motivational Speaker & Corporate Trainer – Shikhar Prajapati told that to get rid of tobacco addiction we should have strong determination power. Already trained more than 3 lakh people. 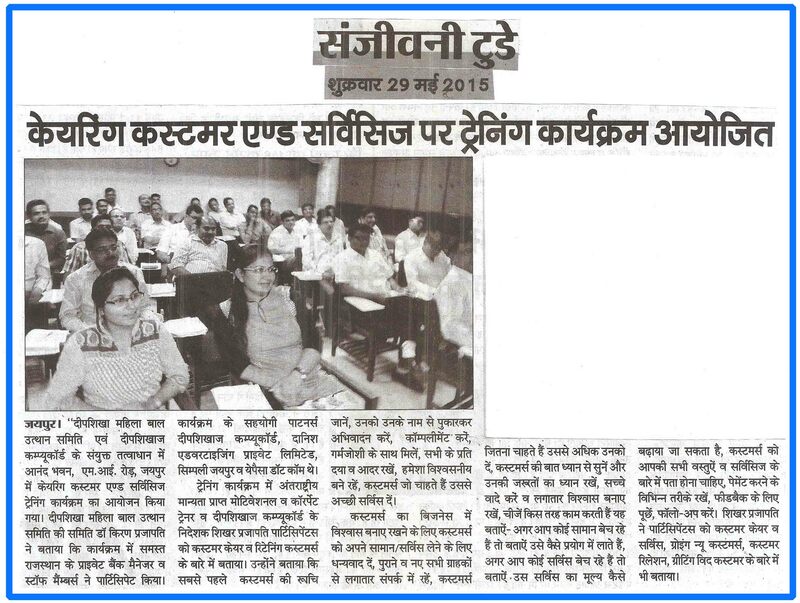 News Coverage in Leading Newspapers of India’s favorite Motivational Speaker and Corporate Trainer – Shikhar Prajapati organized training Program on – “Caring Customers For Success In Business”. 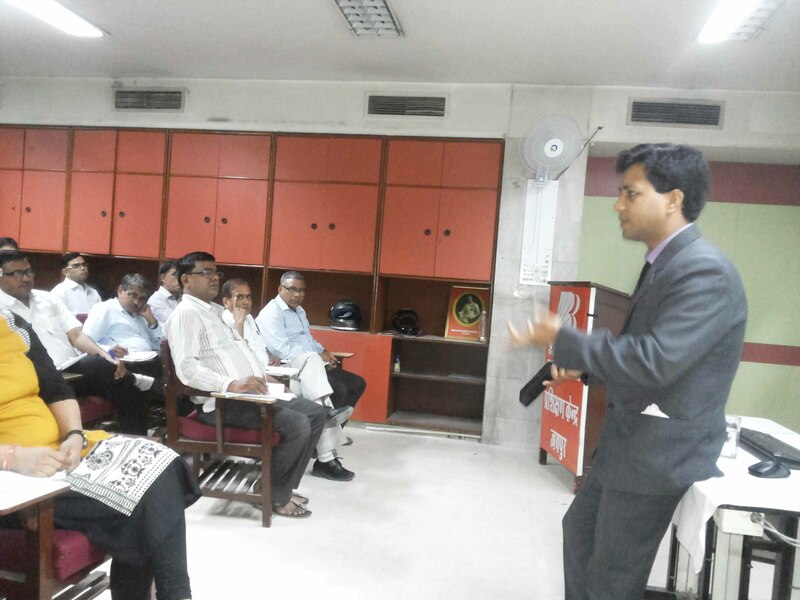 India’s favorite Motivational Speaker and Corporate Trainer – Shikhar Prajapati organized training Program on – “Caring Customers For Success In Business” on 27 May,2015 at Anand Bhawan, Jaipur. Program organized for Branch Manager and staff members of Bank Of Baroda in which participants from different branches participated. Internationally certified Motivational Speaker and Corporate Trainer – Shikhar Prajapati told about Customer Care & Retaining Customers. He told that- first of all check the customers interest, greet them with their names, complement them, meet them with warm welcome and great enthusiasm, keep respect for every customer, always be loyal, give more than customer wants. * Danish Advertising Pvt. Ltd. Already more than 3 lakh people of all age group successfully benefited. 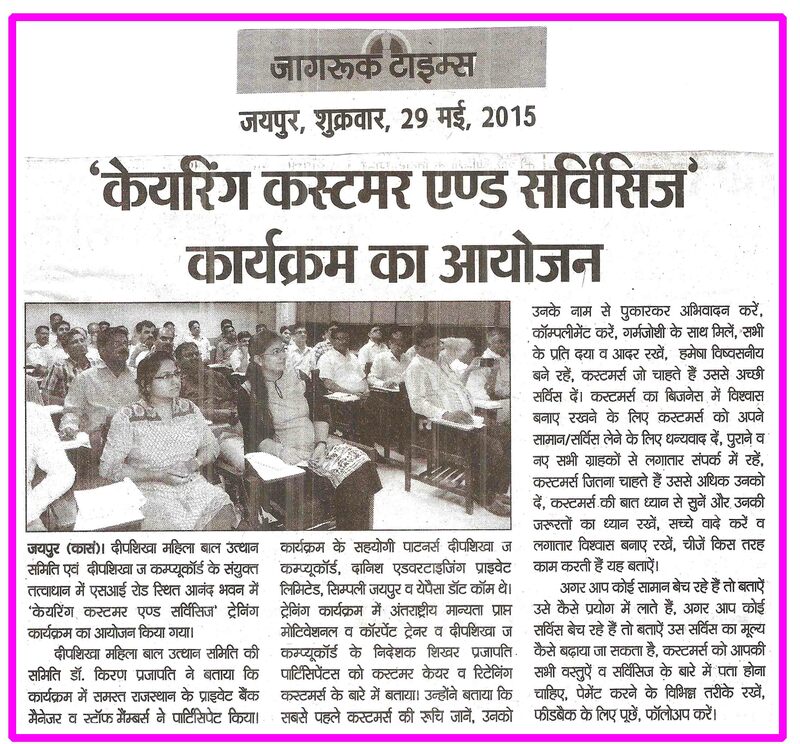 Reputed NGO – Deepshikha Mahila Bal Utthan Samiti is going to organize Training Session on – “Tobacco Is Dangerous For Us” on 30 May,2015 from 9 am to 10.30 am at Kiran Nursing Home, Hatwara Road, Sodala,Jaipur. The Event will be organized on occasion of No Tobacco Day. Eminent senior Doctors will lead the Event and tell about the harmful effects of tobacco addiction. 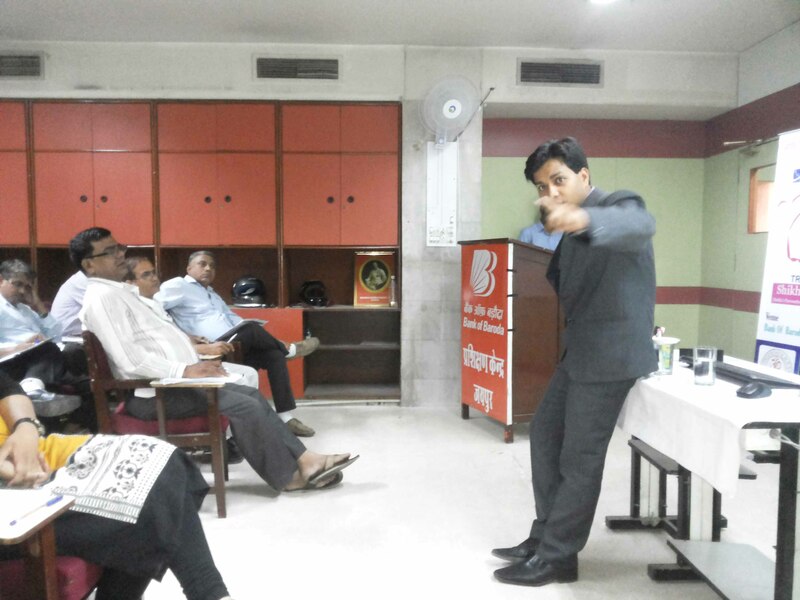 * Danish Advertising (P) LTD.
India’s favorite Motivational Speaker and Corporate Trainer – Shikhar Prajapati organized training Program on – “Caring Customers For Success In Business”. Stay in contact with existing and past clients on a consistent basis. Give the customer more than they expect. Make realistic promises—and be consistent. Explain how things work – If you sell a product, show how to use it. If you sell a service, explain what the customer can do to maximize its value. Bring people together – Linking up your clients and referring them business is a powerful way to encourage loyalty. People never forget who referred them, and by helping them grow their business, they in turn might need your services and products more as well. 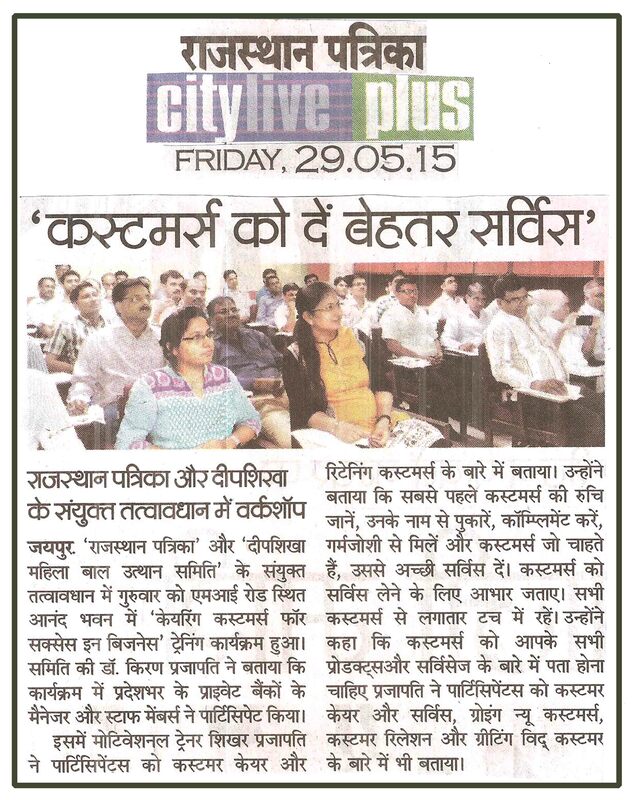 “Caring Customers For Success In Business” on 27 May,2015 for Managers and Staff Members of Banks from all over Rajasthan. Training Session be conducted by India’s leading Motivational & Corporate Trainer- “Shikhar Prajapati” having a successful track record of Motivational Trainings of 13 years. 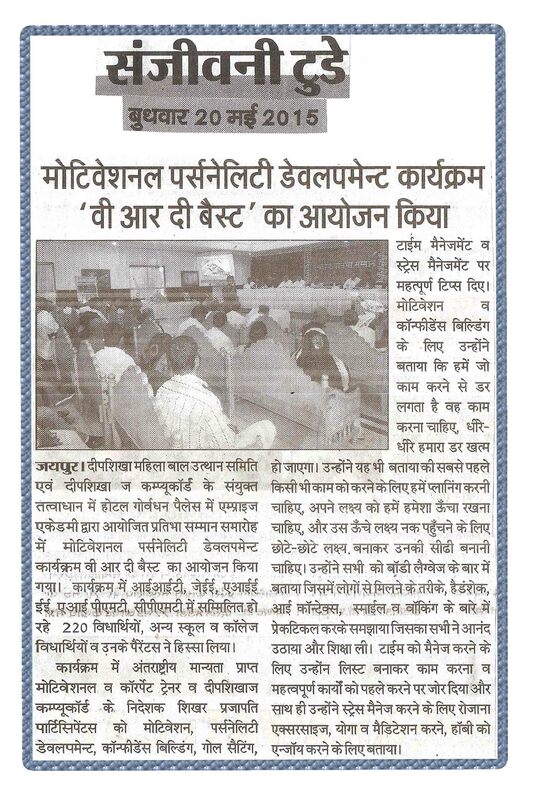 News Coverage in leading Newspapers of Motivational Session– We Are The Best at Hotel Goverdhan Palace, Mathura for Emprise Academy. Training by India’s favourite Motivational Speaker & Corporate Trainer– Shikhar Prajapati. 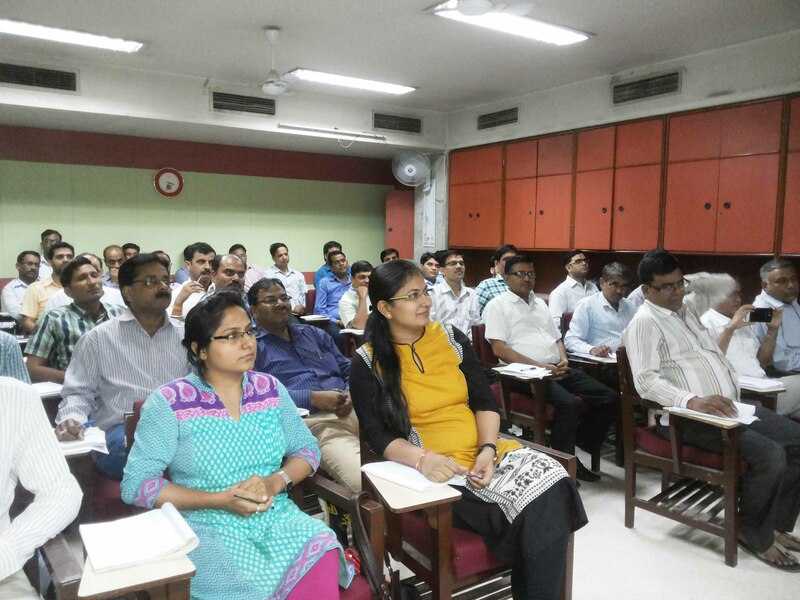 Students of IIT-JEE,AIEEE,AIPMT,AIIMS, CPMT and their parents participated. 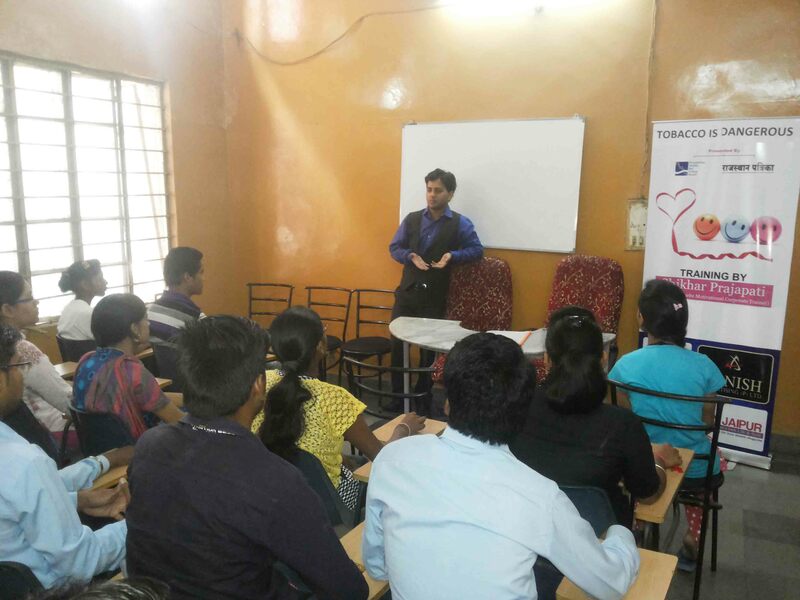 Shikhar Prajapati trained participants on – Motivation, Confidence Building, Goal Setting , Time & Stress Management. 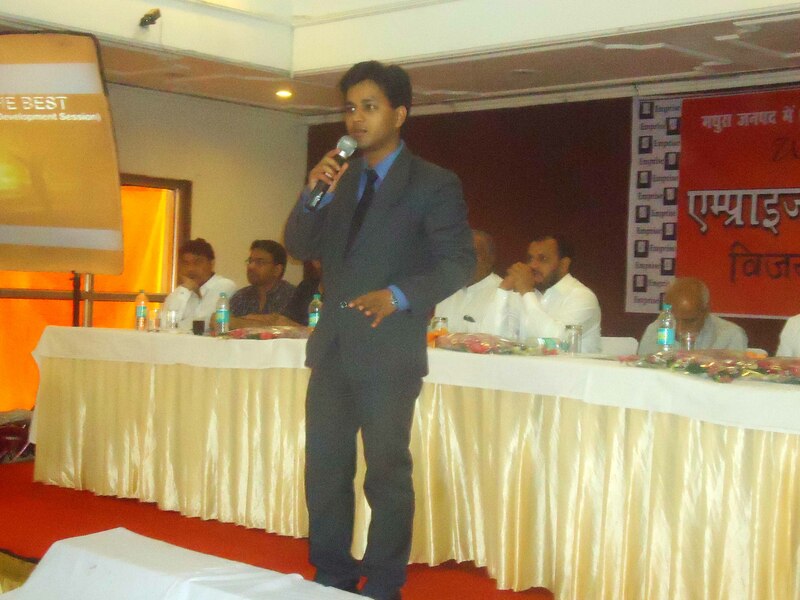 Motivational Session– We Are The Best at Hotel Goverdhan Palace, Matura for Emprise Academy. 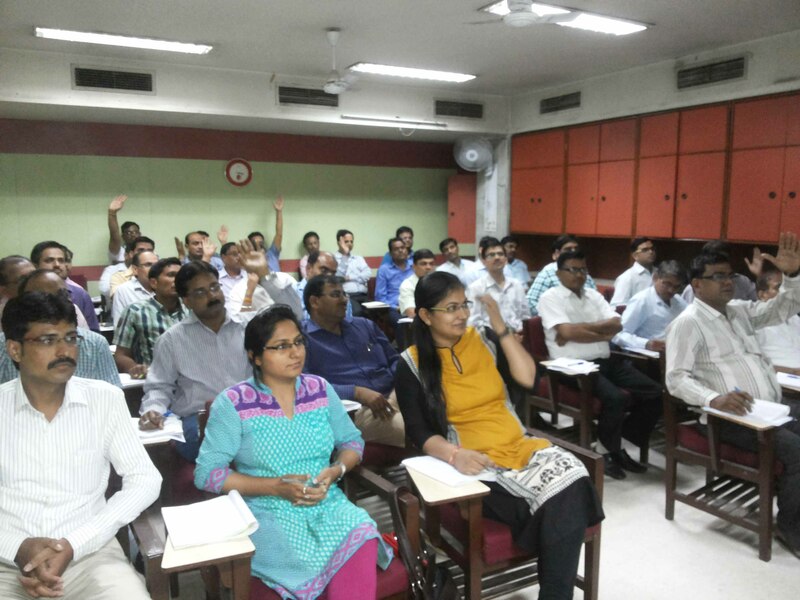 Training by India’s favourite Motivational Speaker & Corporate Trainer– Shikhar Prajapati. 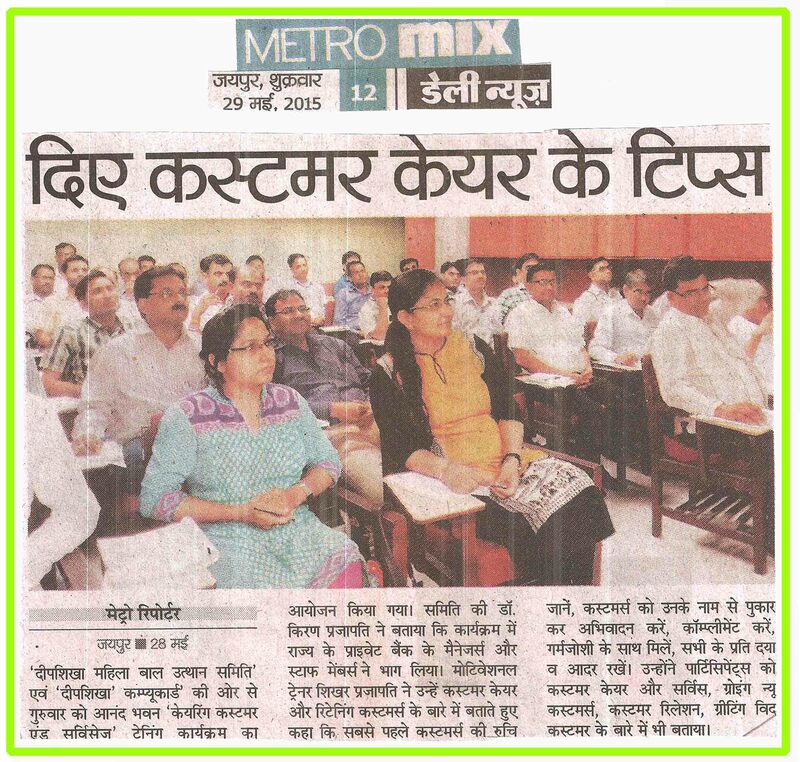 Students of IIT-JEE,AIEEE,AIPMT,AIIMS, CPMT and their parents participated. 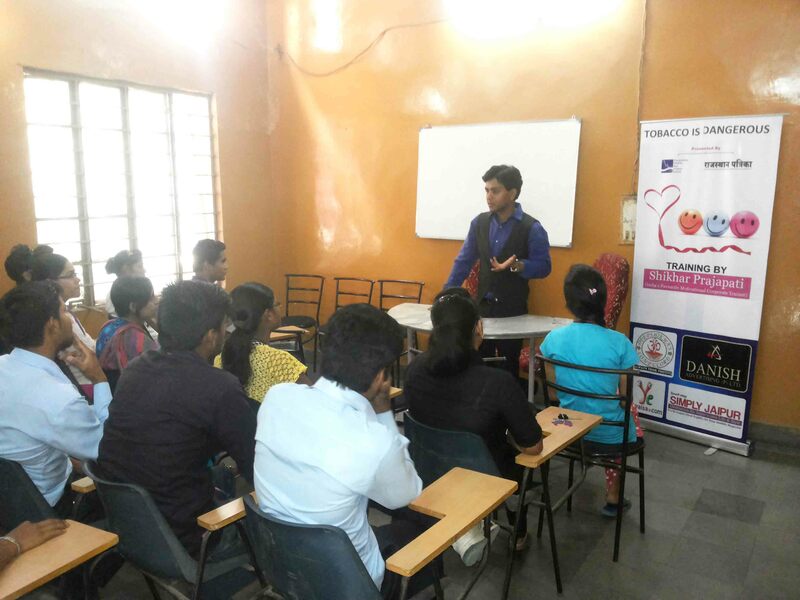 Shikhar Prajapati trained participants on – Motivation, Confidence Building Goal Setting , Time & Stress Management.